It’s a London organisation that has seen considerable success this year. There have been 12″ releases, warehouse parties for Ostgut Ton, and a stint at the Lovebox weekend during summer. 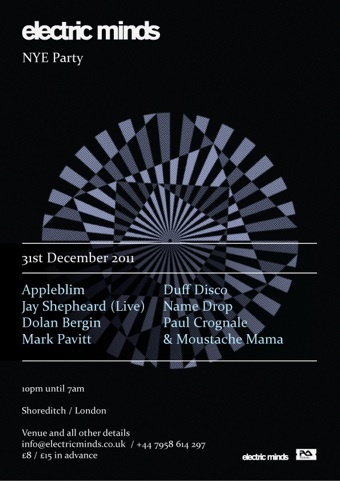 As such it’s no surprise London’s electric minds have some pretty big plans lined up for New Year’s Eve 2011-2012. The venue hasn’t been announced just yet, but it’s set to be in Shoreditch, making for easy access. Which is a good thing, because the organisers have booked Appleblim, Dolan Bergin, Mark Pavitt, and Jay Shepheard for a live set, names that should prove pretty popular. Clearly tickets for this one will be selling quickly, so to help speed the process up simply click here to be redirected towards a reputable retailer. We’ve also listed the full details below, and the electric minds themselves can be found on the end of this link, so best bookmark that page to ensure you know where you’re going and keep up to date with the latest event news.